Industry Experts published the new global market report on Polyols (Sugar Alcohols) titled ‘Polyols (Sugar Alcohols) – A Global Market Overview’. This exclusive report reveals that the Personal Care end-use sector of Polyols is estimated the largest market with 601 thousand metric tons in 2017 while Food & Beverages projected to be the fastest growing with a 2017-2022 CAGR of 3.8% closely followed by Confectionery with 3.7% during the same period. Polyols or sugar alcohols have been used as sugar substitutes in a wide variety of foods, beverages, confectionery and even pharmaceuticals among others. Polyols are not only used for their sweetness, but also for adding bulk and texture, providing a cooling effect, inhibiting the browning that occurs during heating and retaining moisture in foods. The commonly used polyols include sorbitol, mannitol, xylitol, maltitol, lactitol, erythritol and isomalt. Polyols are increasingly used in food and pharmaceutical applications due to their excellent functional properties and health benefits. The demand for low calorie foods containing polyols is expected to grow further, driven by increasing consumer awareness of diabetes, as well as weight management. Sugar-free confectionery, chewing gum and low-caloric diabetic foods are major application areas driving growth in the global polyols market. This global report analyzes polyols comprising sorbitol, xylitol, mannitol, maltitol, erythritol, isomalt and lactitol. The study also explores the key end-use applications of polyols including Confectionary, Food & Beverages, Personal Care and Others (Pharmaceuticals and nutraceuticals). 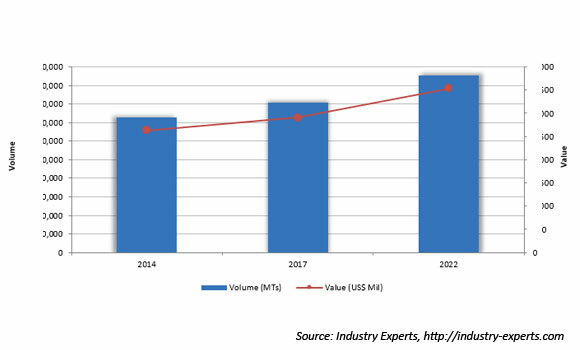 The global markets for the above-mentioned polyol types and end-use applications are analyzed in terms of both volume in metric tons and value in USD for the 2014-2022 analysis period. Sorbitol market estimated in this report does not include sorbitol used as an intermediate in manufacturing Vitamin C.
The global market for polyols (sugar alcohols) is analyzed across major regions namely, North America, Europe, Asia-Pacific and Rest of World. The regional markets further analyzed for 13 more independent countries across North America – United States, Canada and Mexico; Europe – France, Germany, Italy, Russia, Spain and the United Kingdom; Asia-Pacific – China, India, Japan and South Korea. Global volume consumption of Polyol Sweeteners or Sugar Alcohols is forecast to be 1.6 million metric tons in 2017 and is projected to reach 1.9 million metric tons by 2022 at a CAGR of 3.4% between the two years. The report exclusively analyzes the end-use application sectors of each polyol type for all major regions and countries for the analysis period while discussing the overall applications of polyols. Asia-Pacific is the leading global volume consumer of Polyols, forecast to be 899.5 thousand metric tons (55.8% share) in 2017, which is expected to post a 2017-2022 CAGR of 3.8% and reach a projected 1.1 million metric tons by 2022. In terms of value, too, Asia-Pacific dominates the global market for Polyols with a share of about 47%. This global polyols market report includes 952 charts (includes a data table and graphical representation for each chart), supported with meaningful and easy to understand graphical presentation, of market numbers. This report profiles 15 global players and 44 overall major players across the globe. The research also provides the listing of the companies engaged in manufacturing and supply of polyols. The global list of companies covers the address, contact numbers and the website addresses of 101 companies.